Carolina North: Location! Location! Relocation? If there was a theme to yesterday’s third community outreach on UNC’s Carolina North project it was “more of the same”. Same dearth of detail. Same soft sell of the economic benefits. Same back “peddling” (as in wheeling-n-dealing) on their functional commitments. UNC Chancellor Moeser’s “quarterback”, Jack Evans, presented the major recalibration of Carolina North’s raison d’etre as a small side note during the revelation of the first increment of development. According to Evans, the new plan projects that half the 2,550,000 million sq./ft. of development being done over the next 15 years will house extant initiatives already located on main campus, other UNC properties or rented facilities. Prior to yesterday, Carolina North was touted as a catalyst for new jobs (“UNC-CH has plans for a state-of-the-art research campus that would bring as many as 20,000 new jobs to Chapel Hill over the next 50 years.” UNC seeks $25 million to start Carolina North N&O Nov. 16th, 2006). Now, as far as employment, Carolina North has become a convenient place to site their currently dispersed workforce. Having said that, Evans cautioned that the balance between academic and economic development might change dramatically over time – tilting more towards academics as the necessity for moving folks off main campus increases. In other words, Carolina North has morphed from Chancellor Moeser’s “catalyst for the economic transformation of our state” to what is really an overflow campus…. Video of Evans and companies May 29th, 2007 3:30pm Carolina North presentation. Then again, there’s nothing like a little vinegar or Tabasco to cut though the cloying fat of smoked BBQ. On Tuesday evening, at the Orange County BOC meeting in Hillsborough it became glaringly apparent there was a complete failure of do diligence in the Waste Transfer Station site selection process. In fact there was no real process at all. Chairman Carey, 2 years of talking is not a process, it was just 2 years of talking and no basis for a decision. Unfortunately if this failure is allowed to stand the people who will most directly carry the consequences and burden will be the working class African American community on Rogers Road, the same people who have carried the burden of the county’s landfill for 34 years. There is absolutely no way to deny that this failure to act professionally is in itself an act of environmental injustice. There is much irony in that Orange County is considered the most progressive county in North Carolina, and home to Senator Edwards and his Presidential Campaign which is centered around helping the “Other America”. My anger was apparent at the meeting and still apparent in this e-mail, I make no apologies. I am not a politician or a policy wonk. Nor do I make a pretense of tactful persuasion. My wife’s parents lived their lives in north central Philadelphia and were 50 plus year members of the Zion Baptist Church which was led for many years my the late Reverend Leon Sullivan. When visiting my in-laws they would bring us to the church even though I am not a Christian. Listening to Reverend Sullivan was always an education and an inspiration. In my early twenties I remember Reverend Sullivan talking about personal integrity and professional integrity and that both were tied hand in hand. He told us that we can not claim to have one without the other. He was relating this concept from his involvement with American and international business executives and political leaders. With all due respect, by calling for a vote on this issue on Tuesday you were violating your own stated ethical standard. It is clear The Orange County BOC nor anyone else for that matter has all the facts needed to make an informed decision. It is now in the open that the Orange County BOC has never directed anyone or any group to get all the facts. It is also misleading that the BOC can only start “mitigation talks” to compensate the Rogers Road community after a site is chosen. The Rogers Road community has already earned that compensation through their 34 years of sacrifice. Why should they have to acquiesce to a Waste Transfer Station to receive compensation? Discussions can start whenever the BOC decides to do so. It was also clear that Commissioner Foushee, Commissioner Jacobs and Commissioner Gordon were struggling with what they witnessed Tuesday night. Commissioner Foushee was the first to speak with eloquence and concern, articulating her distress on the deficiencies of the process to date. She expressed the desire to get this right. If an academic study were to be conducted on the right and wrong ways to site a waste facility as things currently stand Greensboro would be the case study of the right way and Orange County would be the contrasting case study on how get it all wrong. I am asking all the commissioners: Are you proud of where we are on this issue? Are you proud of how we got here? Is this an example of good governance? If each of you abide the principle of tying personal and professional integrity together then you have no choice but to vote against siting the Waste Transfer Station on Eubanks Road. You have no choice but to restart the siting process. I published David’s earlier correspondence with Commissioner Moses Carey highlighting the lack of a systematic approach in selecting a waste transfer site. Since then, even knowing of this troubling deficit, Carey pushed for an immediate vote to solidify the choice of the Eubanks Road site. But some sense prevailed during last week’s Orange County Board of Commissioner’s meeting as the other BOCC members responded to both the illogic of the current situation and to the many folks that showed up to ask for more prudence. They directed staff not only to do a more exhaustive evaluation but to incorporate a more multi-dimensional approach like the one I’ve previously suggested. I’ve heard a few comments from folks that David is coming on a little too strong. I understand his passion. The calculated lack of process was destined to produce one answer – an answer BOCC member Carey is obviously comfortable with – an answer extending the 34 years of ills the Rogers Road community has borne by decades. That deficit is so glaring, the troubling consequences to the Rogers Road community so apparent, it is an injustice crying for redress. And when the redress comes slowly, grudgingly, even a bit bitterly from our elected folk, well, a little bit of vinegar is quite excusable. [UPDATE] The Chapel Hill News’ OrangeChat noted the growth Mar. 5th. The Durham-Chapel Hill-Carrboro Metropolitan Planning Organization 2035 Long Range Transportation Plan Socio-Economic projections are in and, as Sally notes, they forecast a whopping increase in population. of Chatham County that is in the Triangle Regional Model area. 55% increase in population, 130% in employment! 81,297 folks living in Chapel Hill with employment at 81,227 seems to indicate quite a few folks will be coming from out of town. If you review their maps, it also appears that UNC’s Carolina North plays a huge role in that projected employment increase. This commission will play a critically important role in the development of a unified vision for future transit investments in the Triangle area. The recommendations that the commission develops will be forwarded to the Transportation Advisory Committees (TACs) of both the DCHC MPO and the CAMPO for use in the formulation of their Long Range Transportation Plans. Thanks to Patrick McDonough for the heads up. Part of their agenda is to reevaluate the Triangle Transit Association’s (TTA) Regional Rail plan. Though not averse to appropriate rail deployments, I’d like to see our community support the cheaper, more flexible Bus Rapid Transit (BRT) approach before plunging back into a rail-centric system. Regional transit policy needs an “evergreen” process to address our community’s rapidly changing needs. The commission membership has some real local talent, including former Council member Gerry Cohen (of the excellent NC Bill Drafting ‘blog) and Chapel Hill Planning Board member George Cianciolo (GeorgeC on OP). Here is the membership list of the new 4 county transit planning committee, CAMPO are the Wake/Johnston appointments, DCHC-MPO are the Durham/Orange appointments. Bio sketches are from the staff memoranda. Mayor, City of Raleigh 1971-1973 Secretary of N.C. Dept. of Transportation, 1976 – 1979 Member – Blue Ribbon Commission on the Future of Wake County Managing Director, Public Finance Dept., CitiGroup Global Markets, Inc. Adjunct Associate Professor, Department of Public Administration Director of Community Research and Technical Assistance Initiative Project Director, Transportation Management Bachelor’s Degree Program North Carolina Central University (Chancellor Ammons’ nominee) She has written several grants with the NC Department of Transportation and conducted research on transportation management needs. Former Town Manager (16 years, until 2006), Town of Chapel Hill As Manager, he has been a regional leader on transportation issues. TTA has entered the ‘net realm in soliciting community feedback with their online Design Game. You can vote your wallet on transit priorities there through March 9th, 2007. The choices are a bit slim but at least you can lend your weight towards options you endorse. From Jack Evans concerning housing at Carolina North. would permit the formulation of consensus principles, but we hope our discussion tomorrow afternoon will move us in the direction. The Leadership Advisory Committee on Carolina North had an interesting discussion about housing as a part of Carolina North this afternoon. We believe that housing at Carolina North is a critical aspect of attracting employees, both faculty and staff, to the University, and helping existing employees find housing closer to campus. However, we believe that many issues will require further discussion within the LAC in the process of formulating specific planning principles that will be used to guide planning related to housing. We envision the housing at Carolina North as a mixed-income community. That is, the housing will be a mixture of market, work force, and affordable housing. We need clear understandings regarding the definitions of these three categories. And we do not yet have enough information to set percentages for these three categories, but we will commit to study the issues. The housing planned for Carolina North must be financially feasible, financially sustainable, and market driven. Although the University will likely retain ownership of the land, we anticipate that a large portion of the housing will be privately developed, thus adding values to local tax rolls. On that premise, the housing must provide opportunities for a reasonable return to prospective developers. While housing at Carolina North will not solve all of the housing problems of the Chapel Hill/Carrboro community, UNC-Chapel Hill has a commitment to finding the right mix of market, work force, and affordable housing that will avoid making those problems worse. In this regard the University will maintain the goal that each stage of development at Carolina North will contain some level of each of the three types of housing. It may be appropriate to think of the first stage (approximately 10 years) as a test market that will provide valuable information about housing and will inform planning for subsequent stages. As discussed in the LAC meeting on October19, we do not anticipate undergraduate instruction at Carolina North. Consequently, we do not foresee the need to build undergraduate housing at Carolina North. We do, however, anticipate some level of housing at Carolina North for graduate students and post-doctoral fellows. These groups of residents are likely to be married with children. Since housing at Carolina North is likely to be multi-family construction, this could also assist the University’s efforts to attract the best graduate students and post-doctoral fellows. For this type of housing it is possible, though not necessarily certain, that the University would be the developer and operator of the housing. The discussion of housing during the LAC meeting of October 19 explored linking overall employment at Carolina North and the planned supply of housing. We consider it to be difficult to define and implement a linkage of this sort in advance. A number of questions deserve consideration. For example, what restrictions should apply to housing at Carolina North?. Should CN housing be primarily or exclusively for employees of the University or UNC Health Care System, or should it serve a broader population? What issues related to social and cultural diversity in CN housing should we consider? If work force and affordable housing involve some form of subsidy or constrained appreciation in the form of price caps or restrictions on sale, what issues are raised if some of this housing is occupied by non-University employees? To the extent that University employees occupy housing at Carolina North, use of SOVs would be favorably affected. Similarly, to the extent that University employees living anywhere make use of transit (whether within the service area of the Chapel Hill transit system or not) use of SOVs would be favorably affected. One of the inputs that we need for this and subsequent discussions is information that incorporates our best estimates, stage by stage, of the level of employment to be anticipated at Carolina North. Although we will not be able to formulate these estimates with great precision, it is important to get the order of magnitude approximately correct so that our discussions about housing, transportation, and fiscal impact will be as realistic as we can be at this stage or our work. 5:33pm, Tuesday, Oct. 31st, 2006, Halloween in downtown Chapel Hill means helicopters. As I stepped out of my building at the corner of Church and Franklin streets, the first portent of tonight’s Chapel Hill-o-ween was the thrumming beat of helicopter blades. Two of the beast hovered high above downtown’s Franklin in a vain attempt to suss out the scope of tonight’s festivities. Why vain? Downtown was fairly quiet as the clouds continue to roll in and a very light drizzle falls. Farther from town center, several apartment complexes appeared to be charging for parking. Town staff were busy setting out barrels. And the large portable traffic signs were positioned for action. In years past the hubbub of Halloween is clearly audible from my home. With tonight’s anticipated record crowds the best way to see the action is to take the bus. Realtime bus information available HERE. Trips will begin at 9:00 PM and run until 2:30 AM. The cost is $5.00 per round trip, $3.00 one-way. * J will end at 8:56pm at Rock Creek Apts. * TG will end at 9:20 pm University Mall. For service concerning any of the information, please contact Chapel Hill Transit at (919) 968 – 2769. Chapel Hill on Halloween is quite a sight. Please take your time, take care and, if you think of it, post some pics on Flickr using the tags “halloween”, “chapel hill”, “2006”. Caught between neighbors’ wishes and town policy, the developers of Chapel Watch Village off Eubanks Road have sided with the neighbors. Larkspur connectivity was a big deal in last year’s Council race. A candidate (now council member) even tried to duck discussing alternatives (not surprisingly, the same candidate, who “came around” during the race has been awful quiet on ensuing developments). I support an appropriate level of connectivity between neighborhoods but inflexibly applying our town’s policy in every case to preserve some concept of absolute consistency makes no sense. Her group formed last year to protest the extension of Maywood Way in Chapel Watch, which they say would create a cut-through from Martin Luther King Jr. Boulevard and Weaver Dairy Road to a planned Town Operations Center and other big employers along Eubanks Road. Some of my strongest supporters were Larkspurians – I told them I’d keep an eye on this issue until it was satisfactorily resolved. Though not a done deal, as of today, they’re well on their way to getting an acceptable solution. Hey, maybe they can get that council member I mentioned earlier to jump on board and help shepherd this initiative through the several committees he serves on as Council representative. According to the following Sept. 22nd Town news release, the NextBus system is nearly ready for its trial run. Suggested online access is through Chapel Hill Transit’s www.chtransit.org site, the blue “Real Time Transit” link. I suggest by-passing the lame Java-applet and go straight to the vastly simpler and more forward thinking Google Maps interface. I like the idea of a real-time passenger information system [dynamic updates and reports of bus positions within their routes] but I opposed using NextBus for several reasons. NextBus uses proprietary technology instead of open standards alternatives that could have served both the needs of transit-tracking and blanketed large swaths of town with wireless Internet coverage. NextBus is also charging us more than other communities. NextBus uses cell-phone technology, uses increasingly wretched Cingular for coverage, has caps on cell data transfer [unlike Jane Doe Cingular Cingular customer, they don’t have unlimited plans] and will probably require additional financial outlays to remedy coverage problems. NextBus signage, because of the proprietary lock-in, can not be replaced with cheaper off-the-shelf versions. The PR folks continue to emphasize that the majority of the $950K in tax monies spent came from a federal earmark [the hallmark of many a pork project] as if that means it’s free money – that it’s alright to make a poor deployment decision. Most Chapel Hillian’s pay federal taxes and even if we didn’t that is no excuse for not really trying to do double duty with the same bucket of funds. And, as before, Rep. Price is credited for his help though the campaign contributions received by Price from a NextBus executive and NextBus’ lobbyist remains unreported in the MSM. Chapel Hill Transit continues to move forward. This time, the local public transportation provider announces that the “real-time” passenger information system is up and running. Five bus stop locations in the community have electronic signage that allows passengers to observe the timing of the next scheduled bus arrival and departures. Chapel Hill Transit contracted with NextBus Inc. to procure and install an automatic vehicle location and passenger information system. The new signs are currently operating at the following park and ride lot locations: Eubanks Road, Southern Village, Jones Ferry and Highway 54. The stop on Franklin Street in front of the Caribou Coffee Shop also has an electronic arrival time sign. Plans are under way to equip nine additional stop locations with display signs, Spade said. The “real-time” technology uses global positioning satellites to track buses on their routes. The system estimates the bus arrival and departure times. The information is available through the internet by going to www.chtransit.org, then clicking on the blue “Real Time Transit” link. The majority of the funding for the system was obtained through a federal earmark requested by Congressman David Price. The total project cost is about $950,000. I’ll be giving NextBus a month to hammer out the bugs in their system before reporting on its efficacy. I’ll also keep an eye on service levels, additional costs and any other supposedly unanticipated problems that crop up over the next year. This is my first release of a “fly-by” created with Google’s mapping tool Google Earth [v4.0291.beta], drawing tool SketchUp and published concept plans to model new development in our community. In this case, modeling RAM Development’s 322 luxury condos visual impact. The large McMansion-like teardown, unfortunately, is displacing Hillsborough Street’s affordable 111 unit Town House apartments. Town House has been a low cost haven for students for years. Hillsborough425 aka “The Residences at the Grove” (again, what grove?) will be the largest development of its kind to bless (?) Chapel Hill. Given that and RAM Developments close relationship with Council in the ongoing $100M deconstruction of downtown, the Mayor’s brush-off of greater transparency is troubling. 1) “Flew” to the general location of Hillsborough425. 2) Added Hillsborough425: Current Town House Apt. layout [JPG] as an overlay, changed its opacity to %50, then stretched and rotated it until the roads and features matched up. 3) Set the overlay to be drawing priority #1. 4) Added Hillsborough425: Sept. 2006 Concept Plan [GIF] also as an overlay and adjusted it in a similar manner using both the underlying GoogleEarth features and the current layout overlay. 5) Toggled off the Town House Apt. overlay leaving just the concept plan. 6) Saved the result safely to disk. 3) Outlined the buildings using the flattened concept plan imported from Google Earth and tracing with the LINE tool. 4) Using the Hillsborough425: Concept plan descriptions and other documents as references for each buildings height, used the PUSH/PULL tool to extrude a volume roughly the same height. 6) Using the SELECTION tool to select an element in one building, right clicked and selected all connected components. Once selected, used the MOVE tool to place the building roughly at grade. 7) Exported the finished product to GoogleEarth. Once exported to GoogleEarth, I finished by exporting my alpha-quality project as a KML suitable for GoogleEarth v4.0291.beta. If I get some time this weekend (ha! ), I’ll add in the existing two and four story apartments for scale. 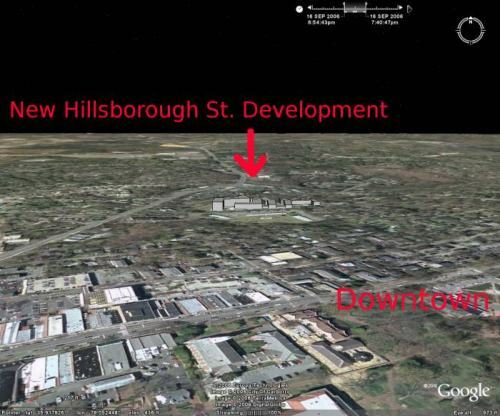 Here’s the Sketchup files (  and ) of the Hillsborough425 buildings, please feel free to build upon my initial effort. My only request is you publish the results for the wider community. That’s the Daily Tar Heel’s Editorial Board. 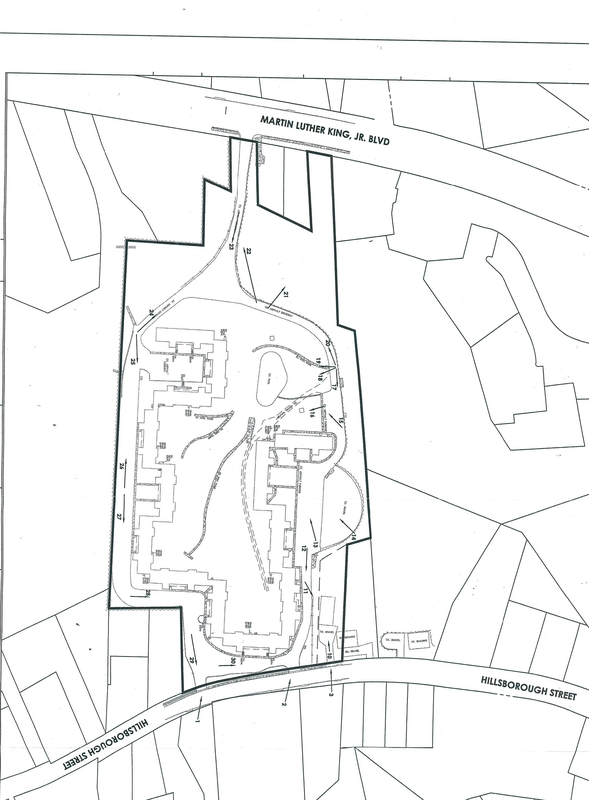 The concept plan to tear down the 111-unit Town House Apartment complex and build 322 new nonrental luxury units called the Residences at Grove Park should be scrapped before any more money is wasted investigating the issue. They share some common concerns: traffic and affordable housing. Local transit activist Ellen Perry posted a heads up Car Free Day 09/22 on local ‘blog OrangePolitics. On Friday, September 22, residents of Carrboro and Chapel Hill will for the third straight year join millions of others around the world in celebrating World Car Free Day, leaving their cars at home and using other means of transportation instead. Residents of Orange County who formally pledge to go Car Free or at least Car Lite (reduced car use) for September 22 will be entered into a drawing for prizes that include Amtrak tickets to Washington, DC & New York, a new bicycle, gift certificates for Squid’s, Spanky’s or 411 West, and more. Anyone can pledge on-line at www.gocarfree.com pledge forms that can be mailed will also be available in the Chapel Hill News and Chapel Hill Herald over the next three weeks. Prizes will be drawn at a Car Free Day celebration to be held on the lawn of Weaver Street Market from 5:30 pm to 7:30 pm on Friday, September 22. Celebrants will find information about public transportation, local biking and walking opportunities, and how to create communities that are less dependent on cars. The Village Project will show their designs and models for transit-oriented, walkable communities on the lawn, and Chapel Hill Transit will demonstrate how to load bikes and wheelchairs onto buses at the Fitch Lumber parking lot (309 North Greensboro St.). add another $4,200,000 in federal & state monies, etc. CH’s contribution of $2,583,000 from taxes is 9.7% of what it collects in property taxes ($2,583,000 / 26,631,000). If we increased the transportation tax portion of property taxes by 10% we would increase the total property tax bill by 0.1 X 9.7% = 0.97%. Since CH taxes amount to roughly 1/3 of a citizen’s total tax bill (county taxes & school taxes comprising the other 2/3) this increase would amount to about a 1/3 of one-percent increase in CH property taxes. Thus, on a $3000 property tax bill the increase would amount to about $9.60. This $811,000 would buy us an additional 14,000 hours of service. On existing routes we could add 4 hr/day for 12 routes for 6 days/week for 50 weeks. Or a number of different scenarios. But remember, you could only increase service on nights & weekends unless you spring for additional buses for use during the day when equipment is currently maxed out. By the way, the town’s Transportation Board has two vacancies, application and more information on joining here.